Action: Choose an opponent. That opponent must discard up to X cards from his hand. X is the number of insane characters in play. Flavor Text: His mind was as a sieve and his memories like ever falling sand. 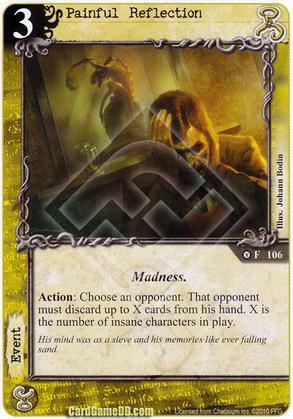 Could be really nice in a Lunatics deck, where you have more control over the number of insane characters. I think too costly for what it does. There are cheaper hand discard options that do the job better. One nice thing about it is that you can use it on an opponent's turn, and it is a madness card so has some synergy with the new upcoming hastur box. Yeah, the best use would be to use it right after your opponent has drawn cards to ideally discard them all. It will likely require a dedicated deck und a way to recur it, though.